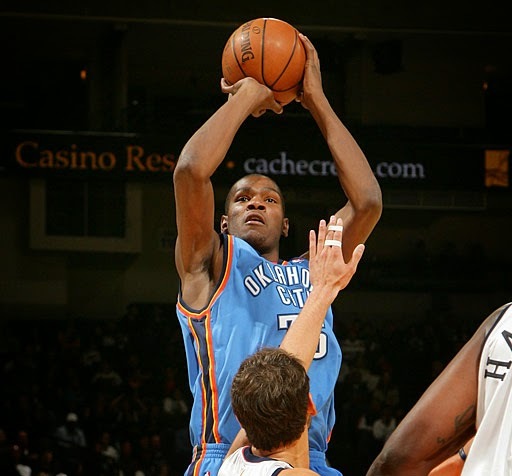 I've been attracted to Kevin Durant as a basketball player since he emerged on the national scene during his one year playing for the University of Texas. The guy just knows how to score. He has now won the NBA scoring title four of the last five years. Yesterday, he was named the MVP of the league. Before I get to his MVP award I really encourage you to take a few minutes and read THIS ARTICLE that I came across back in February. In an interview in early 2014, KD commented that he'd prefer the nickname, "The Servant" more than any other. In hindsight Durant later regretted the comment and the interview because giving yourself a nickname that draws attention to your humility doesn't really work. But his desire for that nickname actually stems from his faith and desire to serve others as Jesus did. Ho hum.... what's that? Another star athlete professing to be a follower of Jesus? Forgive my skepticism, or don't. I'm always reluctant to highlight athletes who make public faith proclamations because so many of them fall short (as we all do) and their shortcomings catch the media spotlight to the extent that all previous statements of faith are overshadowed. For example, an ESPN.com article describing the firing of Warriors coach Mark Jackson makes the point at least twice that he's an ordained minister or pastor. However, the tenor of the article is that his cocky demeanor made him difficult to work with and for and led to conflict. Would you want him as your pastor? An ordained minister away from the court, Jackson often spoke of his Christian beliefs and promised to turn the Warriors into one of the best defensive teams in the league and a perennial playoff contender -- and he did. But Jackson's boisterous personality, at times, did not play well with Warriors management, [and] his staff... Jackson's demeanor, which bordered on confidence and cockiness, might have ultimately cost him his job. So back to Durant... Did you read the article? Did you see the back tatt? This brings me to his 2014 MVP acceptance speech. This is a 25 minute video, but it's truly inspirational. The odds are that you'll tear up. Please do yourself a favor and watch it. So often when we have a captive audience we want to tell the world about ourselves. We want to convince the world that we're worthy of its love. We want to persuade the world to pull for us. We want to tell a story that's new, that will paint us in a good light, that will make people like us. Durant used his 30 minutes in the spotlight to deflect its glare on everyone around him. If you didn't hear the introduction you'd swear he was giving his team a pep talk as he went down the line thanking each of them for the ways they encourage and better him. You'd have a hard time believing he was accepting an award recognising him as the Most Valuable Player in the entire NBA throughout this season. This article on NBA.com is good example of how Durant impressed many people. I heard similar sentiments on sports talk radio throughout the day. It's nice to finally beat LeBron James at something. Thank-you for recognising me as the MVP this year. This is a league of very talented players and it means so much to have my performances this year recognised with this award. I couldn't have won this if I wasn't wearing Nikes. Russell Westbrook, why don't you take next year off too, so I can win another one of these. Durant didn't need to ask anyone to call him The Servant. He just went out and lived like one... at the moment of his greatest personal achievement. As you watch the video of one of the greatest basketball players in the world, it's difficult not to admire his sincerity and authenticity as he thanks those around him for lifting him to the heights he's achieved. I wonder how this compares to our hearts when we thank God for accomplishments in our lives. Do we accept recognition and compliments as "deserved" by us? Or do we truly believe that we couldn't have done it on our own? Do we pay attention and acknowledge the way others in our lives make our accomplishments possible? Are there people in your life that you haven't thanked recently?